Although formerly part of the order Pinnepedia most contemporary taxonomists place the seals in the order Carnivora along with the walrus and eared seals. The Phocidae or true seals, along with their cousins are collectively known as pinnipeds. Their forelimbs and hindlimbs have been modified into streamlined paddle like structures, which make them supremely adapted to an aquatic lifestyle whilst permitting effective movement on land. The true seals or Phocidae lack external ear flaps and unlike the eared seals and walruses, cannot rotate their hind limbs under the rear part of their body to facilitate walking on land. 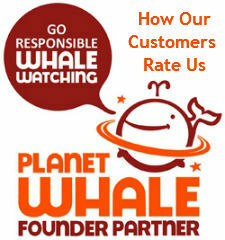 They simply drag themselves along using their fore flippers. For thousands of years pinnipeds have been hunted by indigenous peoples for food, clothing and fuel. Modern commercial exploitation brought many species to the brink of extinction, especially the fur seals, but regulation since the 1950's has allowed many populations to recover their numbers. Major threats to current populations of pinnipeds include over fishing, net entanglement and susceptibility to disease resulting from pollution compromising the immune systems of a number of these populations. 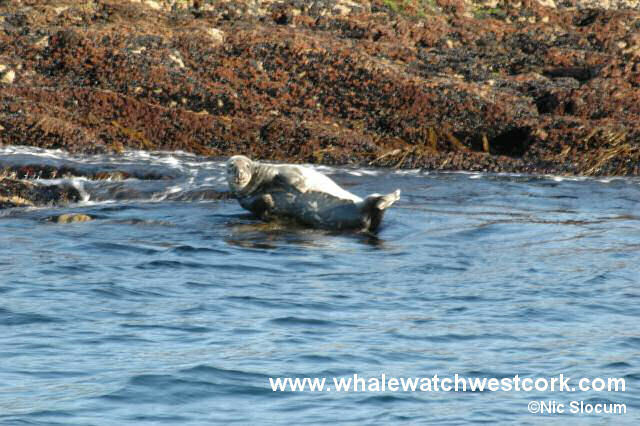 Other marine mammals in Ireland that are regularly sighted on our wildlife boat tours include seals. 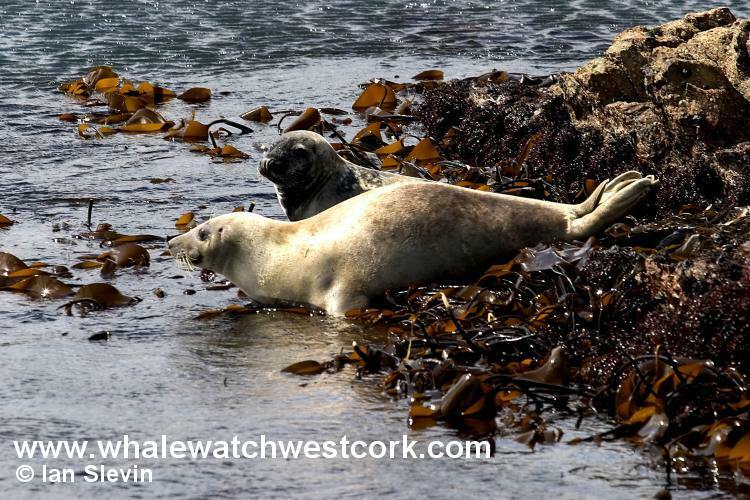 Seals in Ireland comprise the two species, the Atlantic Grey Seal and the Common or Harbour Seal. 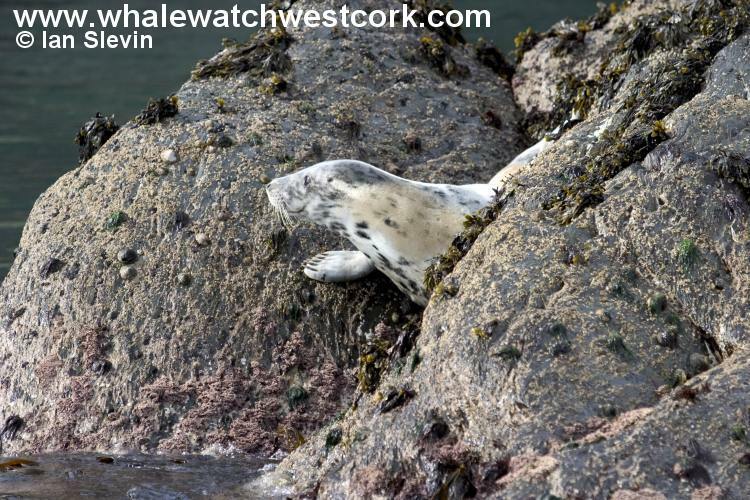 Resident populations of both morphs of the Common or Harbour Seal and Atlantic Grey Seals occur along the West Cork coast and may be seen at any time during the year. Grey Seal pups are born during the later part of the year during September and may be seen during the autumn months hauled out on rock ledges. Common Seal pups are born during the earlier months of the year around May. 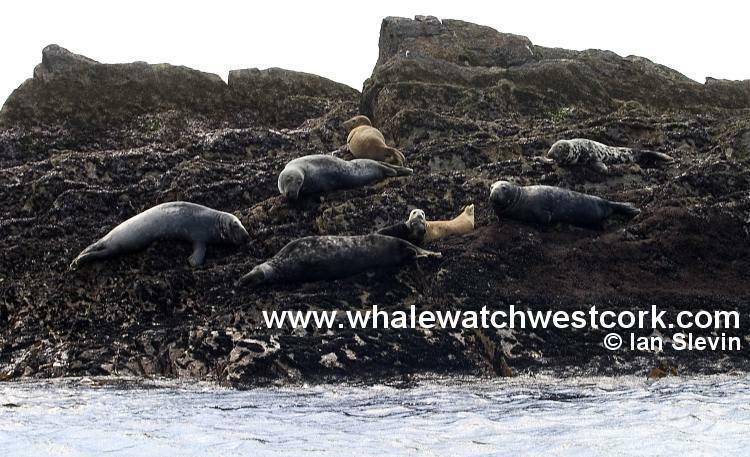 A mixed colony of both Atlantic Grey Seals and Common Seals occurs on the outlying islands off the West Cork coast where we are afforded excellent views on animals both on rocks and in the water. These marine mammals are well established in Ireland. Grey Seals are separated into three distinct populations based on their distribution, size and breeding season. Animals off West Cork comprise the Northeast Atlantic population, which numbers around 102,000 animals. Over 80% of this Northeastern Atlantic population of seals is located around the shores of Ireland and Britain. Characterised by the arched "Roman" nose, thick neck and skin folds, Northeastern Atlantic Grey Seal males are larger than the females averaging around 2 metres in length. Females average 1.8 metres. The current population size of the Common Seal in UK and Irish waters is estimated at 30,000. Common Seals are smaller than Grey Seals with males having a length of 1.8 metres. Females are significantly smaller reaching lengths rarely exceeding 1.5 metres. Size is an important factor in telling the two species apart but next to that is the shape of the head. Common Seals lack the angular features of the grey seal and have a more rounded head with a distinct forehead and dog like snout. They frequently adopt a head up - tail up position when hauled out. Over fishing and entanglement in fishing gear continue to threaten both these seal species.